Digital video security cameras may need CCTV housings, especially if they will be placed outdoors or in a potentially violent or hazardous environment. Though some cameras are made with protective Closed Circuit Television or CCTV housings, other may require that you install your camera in one before mounting. Security Camera King offers a wide selection of outdoor cameras and CCTV housings. Normally when a digital video camera is marketed as an “outdoor” camera, it comes from the manufacturer with its own protective housing for use outdoors. However, some outdoor cameras still require CCTV housings under certain conditions. You may have noticed that certain CCTV housings or outdoor cameras are accompanied by an IP rating that usually looks something like this: IP56. This is actually a rating based on a standard created by the International Electrotechnical Commission or EIC. 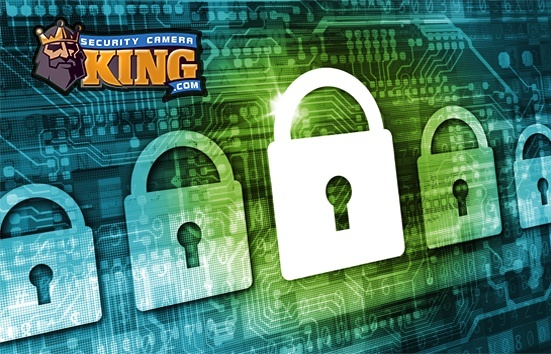 This rating was designed to provide consumers and manufacturers with a more precise yet standardized method of describing the protection that is offered to an electronic device, in this case of course, the digital video security camera. The IP rating or sometimes called the IP code stands for International Protection Rating or Ingress Protection Rating. Some times the rating may include a letter after the two digits, but that is seldom seen in reference to CCTV housings or cameras and is really irrelevant for these applications. The two digits following the “IP” however, do have a meaning. Let’s take a closer look. The first digit of the IP rating represents the degree of protection offered against solid material. This digit’s range is from 0 to 6, with 0 indicating no protection whatsoever and 6 meaning the CCTV housing is absolutely dust tight. For a sense of the rating, a 2 means protection against ingress of objects greater than 12.5 mm such as fingers or other objects. The second digit of the IP rating represents the degree of protection offered against liquid material. The digit range in this category is from 0 to 8, again with 0 indicating no protection whatsoever from liquids. A rating of 8 however, indicates that the CCTV housing can with stand immersion in water beyond 1 meter in depth. Once again for a sense of the rating, a 4 means protection against splashing water against the housing from any direction shall have no harmful effect on the camera. A good IP rating for a CCTV housing is at least IP55. Dome and Bullet type digital video security cameras are the most likely models to be manufactured with their own “built-in” or perhaps more accurately, “built-on” CCTV housings. Likewise, these cameras are also most likely to be marketed as “outdoor” or “indoor/outdoor” use cameras. Security Camera King carries many different types of indoor/outdoor dome cameras including those whose CCTV housings are classified as “vandal proof.” Outdoor dome cameras are often installed in vulnerable locations; that is, since they are the most visible component of a digital video system they are usually installed in areas of high risk (if the system’s layout is designed correctly). These cameras come with a strong metal housing, no visible screws (that could otherwise be maliciously undone), and very strong Lexan domes. Most of our bullet-shaped cameras come with their own CCTV housings and are marketed as indoor/outdoor types. Bullet cameras are typically used outdoors in areas of low-risk vandalism because the cameras can maliciously be repositioned rather easily. 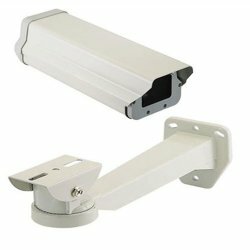 Box cameras are very popular cameras; however they usually offer no weatherproofing CCTV housings or mounting hardware. If these cameras are purchased with the intent to use them outdoors, you’ll want to purchase you’ll want to purchase our Metal CCTV Security Camera Outdoor Housing with Mount (product # OUTDOOR_HOUSING). However, if your box camera will be used outdoors in extremely cold climates, you’ll risk fog and condensation forming inside the housing and on the camera lens. In this particular case, you may want to consider purchasing Security Camera King’s Outdoor Camera Housing with Heater and Blower (product# OUTDOOR-HEATED-HOUSING) for just a few dollars more. Finally, we should mention that we also offer a very large variety of explosion proof CCTV housings and mounting brackets. Explosion proof housings prevent any volatile and potentially flammable vapors from coming in contact with the camera’s electrical components which could cause the gas to ignite. These housings are also made of hardened stainless steel that is able to withstand severe weather conditions. These are excellent for use in any area where extreme security measures are required.